Semi Driver is a truck parking simulator with realistic physics and awesome 3D graphics. Discover many challenging missions without any time and attempt limitations. 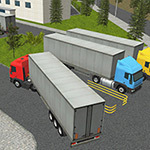 Drive the trialer truck through large city environment and follow the arrow indicator to find the right parking space. the job but avoid hitting other vehicles, buildings or other obstacles in your way.